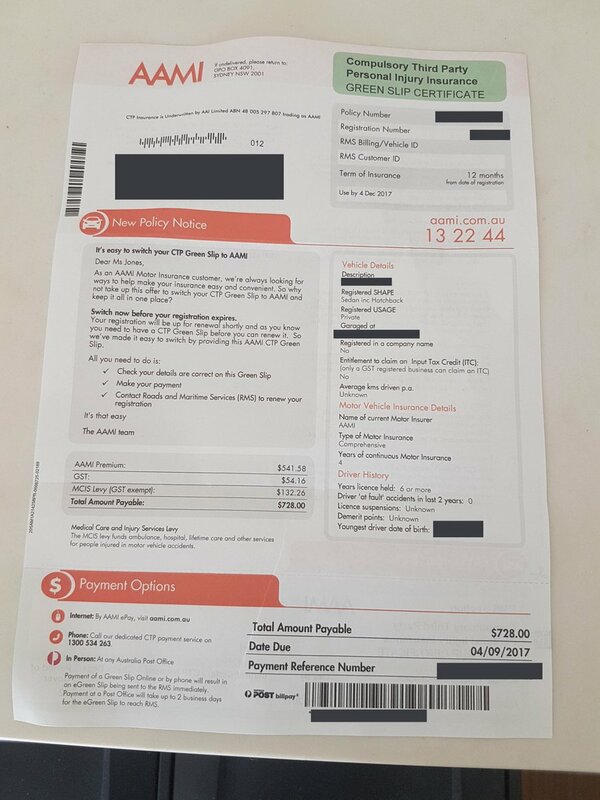 Recently, actress and comedian Natalie Tran slammed Australian insurance provider AAMI for sending her an advertisement disguised as a Compulsory Third Party (CTP) Green Slip. Last Tuesday, Ms Tran tweeted her 260,000 Twitter followers a photo of paperwork containing a due date, policy number and payment slip. Ms Tran said she mistook it for an actual bill, and almost paid it. Apparently, this is not the first time for Ms Tran’s family. Her parents have also received similar advertisements in the mail. This brings into question whether Australia’s general insurance provider’s advertising practice is “misleading” under the Australian Consumer Law (ACL). 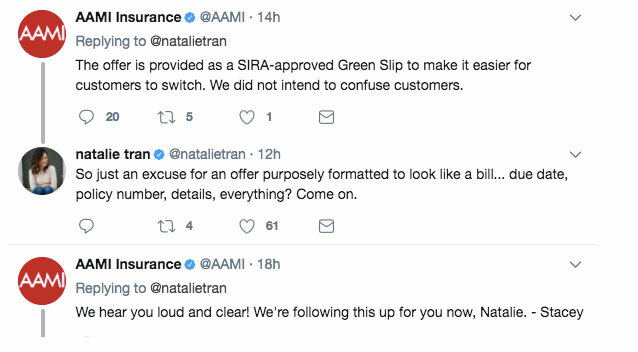 According to a statement to Fairfax Media, an AAMI spokesperson said the letter was designed as a Green Slip “to make things easier for customers” to obtain CTP insurance without having to take additional steps. At the top of the letter there is a noticeably large red heading that states “New Policy Notice”. It is supported by an opening paragraph detailing it is an offer sent to third-party property motor insurance customers to switch to their CTP Green Slip to AAMI. A few paragraphs later, there are payment options and an amount of $728.00 due on September 4. The design of the letter is believed to be approved by NSW Government CTP regulator, State Insurance Regulatory Authority (SIRA). In addition, the letter is used as the “official certificate” for all AAMI CTP Green Slip, including new policies and renewal notices. Although the insurance provider sees this advertising practice as common and unproblematic, is it actually legal under the ACL? Is It Legal For Businesses To Make An Advertisement In The Form Of A Bill? Generally there are two fundamental rules of advertising and selling found in the ACL. Be aware it is possible to breach both statements. Ultimately, it is illegal for businesses to engage in conduct that misleads or deceives or is likely to mislead or deceive consumers or other businesses under the Competition and Consumer Act 2010 (Cth). Irrespective of whether a business did not intend to mislead or deceive, or no one suffered loss or damage as a result of its conduct, the law will still apply. In relation to the recent AAMI scenario, it may be argued the insurance provider has asserted a right to payment. Under the ACL, it is illegal to request payment for goods or services the consumer has not agreed to buy. Here, there was a section in the letter that used the words ‘Amount Due’ and ‘Due Date’, which could mislead the recipient to think it is a bill when in fact it is an offer regardless of whether they are an AAMI customer or not. In order to avoid any misunderstanding, AAMI could have explicitly made clear at the top of the letter it is not a bill. Otherwise, AAMI’s conduct may constitute a contravention of the ACL under the Act. 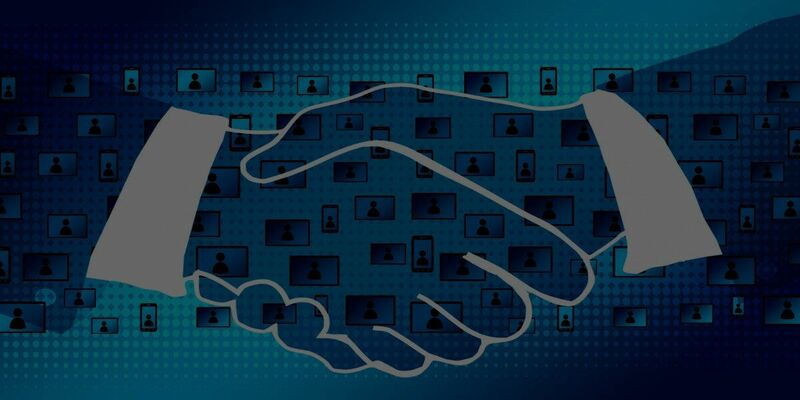 The Act prohibits a person in trade or commerce from sending another person an invoice or other document that states the amount of payment for supplying unsolicited goods or services. It may be acceptable if a warning statement that complies with the requirements is set out as mentioned above. The key take-home is businesses should avoid using advertising tactics similar to AAMI when promoting their goods and services. However, if businesses decide to do so, then it is wise to insert a warning statement as mentioned in the Act. If you have any questions or need advice about your business’ obligations or how your business advertises its goods or services, you can contact one of LawPath’s expert business lawyers.